At Silk Bedding Direct we go that extra mile to make truly exceptional, top of their class, luxury mulberry silk-filled pillows. Mulberry silk-filled bedding is our specialism. All silk bedding is produced by ourselves, assuring total quality control. We promise you will not be disappointed. Buy now and a free high quality carry and store case will be included for each mulberry silk-filled pillow ordered. All Silk Bedding Direct silk-filled pillows are filled with hypoallergenic top grade long-strand mulberry silk wrapped around a medium-strand pure mulberry silk core. All 100% natural and hypoallergenic mulberry silk and nothing else. 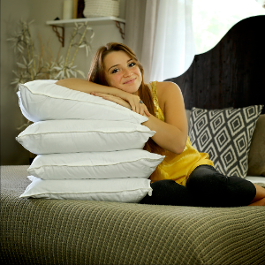 The silk-filled pillow casing itself is a soft and comfortable yet durable and and long lasting 300 thread count cotton sateen. The quality of the mulberry silk used for the interior of Silk Bedding Direct silk-filled pillows (and all Silk Bedding Direct silk-filled bedding) is so high that no treatment of any kind is required. No chemicals, other substances or materials, or any other kind of treatments are used. Because it is 100% natural and untreated the silk remains rich in the naturally occurring amino acids that are so good for our skin and hair, keeping our skin young and our hair naturally nourished. As we spend around a third of our lives in bed these are really great properties for your pillows. Please be aware that some pillows are advertised as mulberry silk but in reality contain off-cuts of mulberry silk left over from the production of other products. These off-cuts are then seamed together to give the appearance of unadulterated mulberry silk (the same method is sometimes undertaken in the production of silk-filled duvets and mattress toppers too). The seaming process requires other materials and chemicals, and the finished “seamed” silk is then bleached to hide the process. 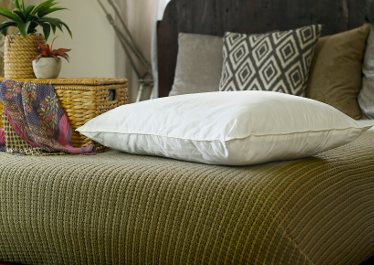 Silk pillows made in this manner can still be legally described as 100% mulberry silk and are cheaper to produce, but have lost much of their natural health and beauty properties during the process and are an inferior pillow. You can be sure of the best by buying Silk Bedding Direct. 1. Totally clean! - all other types of natural bedding contain thousands or even millions of dust mites, mold, fungus and other microscopic life (and their droppings!). These cannot live in mulberry silk. 2. Helps delay skin aging - mulberry silk contains several naturally occurring amino acids which actively delays skin aging, rejuvenating you throughout the night and helping to keep you looking young. 3. Protects skin from further damage - a natural part of mulberry silk is the protein sericin which leaves a protective barrier on skin helping prevent further damage. 4. Nourishes and protects the hair - in the same way that the skin is nourished and protected the amino acids and the protein sericin nourish and protect your hair too. 5. Promotes relaxation in the central nervous system - mulberry silk has natural properties that promote relaxation in the central nervous system. 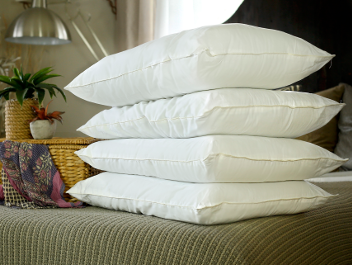 It's therefore totally ideal for use within a pillow as it aids restful sleep. This also makes mulberry silk-filled pillows ideal for anyone with any degree of insomnia too. 6. Very little cleaning required - under normal circumstances cleaning your silk-filled pillow will almost never be required. Over a long period of time, if it becomes a little flatter from usage, simply air outside preferably on a sunny day. Even after years of usage this should return your luxury silk-filled pillow to a nearly new condition. 7. Hypoallergenic - meaning people with allergies and asthma are not irritated by mulberry silk. This is good for people without allergies too because it means it is soothing to the body. The absence of dust mites and bed bugs makes hypoallergenic mulberry silk-filled pillows excellent for asthma suffers too. 8. Longer life - Silk Bedding Direct mulberry silk-filled pillows have a longer life than other forms of luxury pillows as mulberry silk does not fall apart and degrade over time. 9. Money-back Guarantee - In the highly unusual situation that you are dissatisfied in any way you can within 14 days of receiving your silk-filled pillow use our "no questions asked" full money back guarantee - we will even pay the return delivery fee, you are totally covered. Buy now and a free high quality carry and store case will be included for each pillow ordered.